The skeletal system constitutes an entire framework consisting of bones, joints, cartilages, and ligaments, which serves to provide a well-defined shape for the human body. Apart from structural support, the skeletal system provides protection for visceral organs including the spinal cord, acts as the point of attachment for muscles, facilitates movement, participates in blood cell production, calcium storage and endocrine regulation. However, the bony framework of the body seldom begets the day-to-day attention it deserves. “To thrive in life, you need three bones: A wishbone, a backbone and a funny bone” ~ Reba McEntire. A healthy backbone, both literally and figuratively, is essential for human beings to stand tall and remain strong. Dr. Benjamin Tow Phak Boon, a consultant spine surgeon from Mount Elizabeth Hospital Singapore says, being mindful of your posture is key to maintaining a healthy backbone. In his recent visit to Sri Lanka, facilitated by the Parkway Patient Assistance Center (PPAC) Sri Lanka, in collaboration with Parkway Hospitals Singapore, Dr. Tow, shared his expertise on common orthopaedic issues such as osteoporosis, osteoarthritis, back pain and slip disc. Slipped/herniated discs, and osteoarthritis of the spine are what are known as degenerative spine conditions where loss of structure and function occur gradually and is usually caused by ageing. Spinal deformities, limited motion and chronic pain at movement or rest are common signs and symptoms. The spine serves as a pillar to support the body’s weight and to protect the spinal cord. There are three natural curves in the spine that give it its shape These curves help the spine withstand stress by providing a more even distribution of body weight. The spine is made up of vertebrae which are a series of bones that are stacked on top of each other with cushions called intee vertebral discs in between to help absorb shock and load. The inter-vertebral discs are composed of fibrous tissue on the outside and contain jelly-like material on the inside, playing a vital role in shock absorbing. Overloading of the spine, caused by bad posture, certain sports, lifting heavy weights and being overweight, lead to gradual tearing of the fibrous tissue and causes ‘disc failiure’ over time. This is commonly known as ‘slipped disc’. 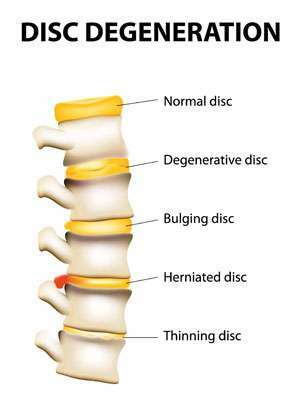 The inability of the disc to effectively bear and distribute body weight, results in chronic back pain, especially on prolonged sitting and while changing the posture. Further, once the fibrous tissue is subject to tearing, the jelly-like material within is pushed out. The protrusion if the disc compresses nerves above or below the disc, thus nerve pain ensues and manifests as thigh and leg pain. If the herniated disc is in the neck, pain can be experienced in the arms, shoulders and shoulder blades. Good posture distributes the body weight in an even manner and thus the load on the spine is considerably reduced. Practicing a good posture, not only while sitting and standing, but also during lifting heavy objects helps to have a strong spine. Maintaining an ideal body weight is essential for maintaining a healthy back. Sitting in a place for more than 30 minutes continuously can contribute to the development of back pain, says Dr. Tow. Using electronic gadgets such as laptops and mobile phones over a prolonged period of time makes us assume a position where you are eternally bending forward, and we tend to unconsciously remain in that position for hours. This position places a load on our backs and necks. Dr. Tow advises his patients, especially those who are office employees, to stand up, bend backwards and stretch every 30-40 minutes and to avoid prolonged sitting. The act of bending forward and twisting your spine, commonly seen in sports that involve high speed and high intensity torque, like golf, tennis, squash, rowing and bowling bears the risk of developing a disc failure over time. However this doesn’t brand the sport as risky. Adequate warm-up exercises before playing can considerably reduce adverse outcomes over time. When asked about another prominent bone related disorder osteoporosis, Dr. Tow explained further touching on the pathogenesis of the disease. Osteoporosis is a condition where the bone density becomes poor due to loss of mineralization of the bone, over time. This leads to weakening of the bone structure, and the bones involved are prone to easy fracture. This condition is asymptomatic and diagnosis is made either through bone density screening or if the patient presents with a “fragility fracture”. Fragility fractures can be the first symptom of osteoporosis. Due to increased bone fragility, patients with osteoporosis suffer fractures even in benign injuries, where under normal circumstances one wouldn’t encounter a fracture. The most common bones involved are the wrist, hip and the back bones. Dr. Tow advises post menopausal women to take a bone density screening test every 3-4 years, to monitor development of osteoporosis. Women who have had their ovaries surgically removed or have thyroid complications and women who are under steroid medication are particularly at risk for osteoporosis, and they would benefit from bone density screening tests for early detection and prevention of osteoporosis. In order to prevent development of osteoporosis, perimenopausal (women nearing menopause) women are advised to take calcium supplements on a daily basis, as our daily dietary intake of calcium is usually inconsistent with the calcium requirement of the body. When the calcium requirement of the body is not met adequately, the necessary calcium is taken from the bones, making the bones brittle and fragile over time. Even though the calcium intake helps prevent the progression of osteoporosis, calcium cannot be adequately absorbed in the absence of vitamin D. Exposure to sunlight, especially the morning stimulates natural production of vitamin D in the body. Those who are not exposed to sunlight may benefit from vitamin D supplements, however vitamin D is usually Incorporated in calcium supplements. Weight bearing excercises, such as walking helps stimulate the bones and build the integrity of the bone over time.15 minutes of exercise daily is adequate to keep the bone stimulated. Avoiding smoking and consuming food products rich in calcium and vitamin D aids in protection from the development of osteoporosis. As explained by Dr. Tow, osteoarthritis is a condition arising as a result of wear and tear of the joints. Old age, over usage of joints and daily wear and tear contribute to the development of osteoarthritis. Unlike osteoporosis which is a silent disease, osteoarthritis produces pain and inflammation in the involved joints. Osteoarthritis can be prevented from progressing further by reducing the load on the weight bearing joints, by avoiding activities that load the joints and by reducing the body weight. Medications to reduce pain and discomfort can be prescribed and surgeries to lubricate joints are available, to improve quality of life, especially in elders whose function has been compromised due to pain and stiffness. Glucosamine and collagen supplements are believed to be beneficial by some, but there is no strong scientific basis proving their efficacy in prevention of osteoarthritis. However, they may slow down the progression. Dr. Tow also explained how while some yoga poses are beneficial, some poses involving sitting and hunching forward are not ideal for those who have a weak spine, as it produces a huge frontal load on the back. Advice from a proper yoga instructor rather than self-taught methods can help in avoiding complications over time. Prevention is the key, and simple measures such as maintaining a good posture can take you a long way, after all, the integrity of the skeletal system is essential both aesthetically and for maintaining a healthy quality of life. 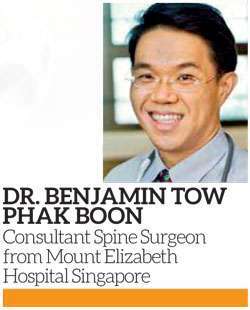 Dr. Benjamin Tow Phak Boon, MBBs, FRCS, MMed Ortho is a consultant spine surgeon whose focus is on degenerative conditions of the spine, deformity-surgery and minimally invasive spine surgery. He is a fully qualified orthopaedic surgeon and is also well versed in paediatric orthopaedic conditions.